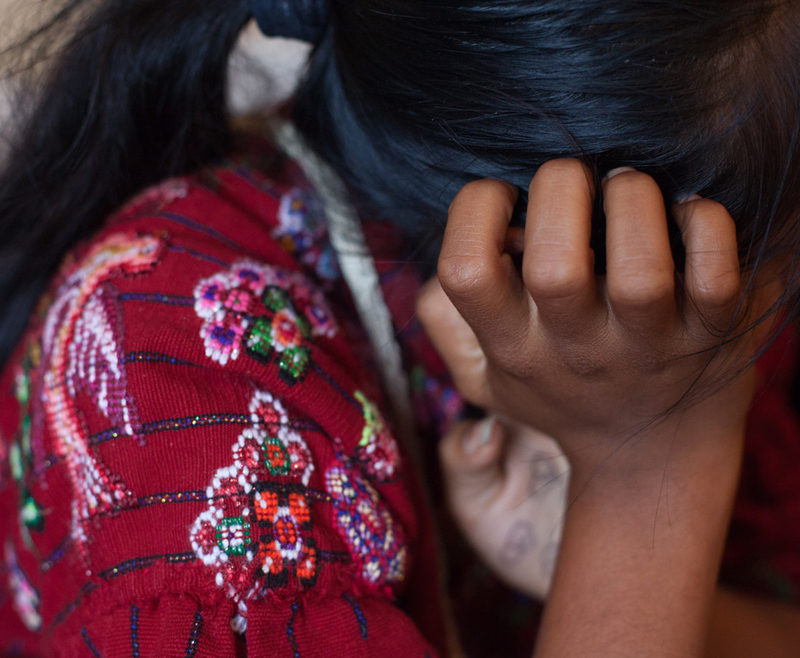 Armed guards, withheld identification papers, deferred wages and debts to employers are both classic signs of forced labour and daily fare for many Guatemalan coffee workers. The man in the dark brown shirt has come with a group of coffee workers to a safe location in the city of Huehuetenango in western Guatemala to speak to Danwatch about life on Guatemala’s coffee plantations. The meeting must be held in secret, and workers can give only anonymous statements, because they risk the loss of their jobs, as well as threats and violence. Other workers and union representatives confirm the story told by the worker in the dark brown shirt: the middlemen who hire the workers to pick coffee keep their personal identification papers throughout the period of their employment on the coffee plantations. “The retainment of personal identification papers is a classic sign of forced labour,” says Anders Lisborg, an international expert in forced labour and human trafficking. Confiscation of identity papers is just one of many indications that forced labour is widespread on Guatemala’s coffee plantations, where armed guards and debts to plantation owners make it practically impossible for some coffee workers to leave their jobs. The middlemen who hire people to pick coffee often retain the workers’ identification papers while they are employed on the coffee plantations. Photo: James Rodríguez. Many of Guatemala’s coffee workers, including the one in the dark brown shirt, are internal migrants. Typically indigenous Mayans, they are driven by poverty to travel to other parts of the country with their entire families to work the coffee harvest. They are often hired by middlemen who find work for them on coffee plantations in exchange for either a fixed price per worker or for a percentage of their wages. “Often, the workers don’t know the plantation owner, only the middleman that hired them,” explains Lesbia Amézquita, legal counsel for the labour organisation Movimiento Sindical, Indígena y Campesino Guatemalteco (MSICG), which strives to improve the circumstances of Guatemala’s coffee workers. The middleman transports workers and their families in trucks to the coffee plantations, which may be several hundreds of miles from the workers’ homes. “The workers speak different Mayan languages, and so they can’t necessarily communicate with each other,” says Amézquita. There are twenty-two different Mayan languages in Guatemala, and since many Mayans do not understand Spanish, they cannot communicate with the plantation owner without an interpreter. If the workers are unhappy with their working conditions, there’s not much they can do about it. “In principle, the workers could leave the coffee plantation, but they would have to do it without their identity papers, without their pay, and without being able to speak the language,” says Amézquita, adding that they usually don’t even have enough money to pay for transportation back to their hometowns. 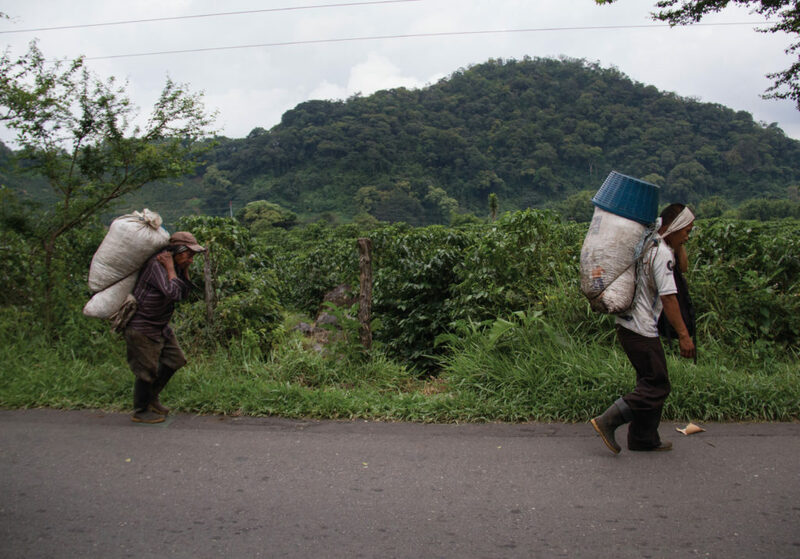 On some of Guatemala’s coffee plantations, workers end up in debt spirals. Their wages are withheld until the coffee harvest is completed, and in the meantime, workers must purchase food and other necessities on credit from the plantation owner. During the most recent coffee harvest, the worker in the dark brown shirt picked coffee on a plantation with his wife and two sons. Even though the four of them picked coffee all day long, their debt to the plantation’s owner continued to grow. “We were told that we would not be paid until the coffee harvest was over,” says the worker. Since he had no money, he was obliged to buy food on credit in a store on the coffee plantation. According to José Chic, a member of the labour union Comité Campesino del Altiplano, it’s not unusual for coffee workers in Guatemala to receive no wages until the end of the harvest, despite the fact that the law requires coffee workers to receive their pay every two weeks. “It’s a way to control the workers. If they need food or other necessities, they must buy it on credit from the plantation owner. That way, they are dependent on him,” says Chic. The coffee worker in the dark brown shirt knows how difficult plantation life can be. On the plantation where he and his family picked coffee during the last harvest, the workers all slept in one large concrete building without outer walls called a galera (galley, ed.). Families lay pressed up against each other, directly on the cold concrete floor, while the whole plantation was watched over by armed guards. “The guards are there to protect the plantation owner, not to protect the workers,” he says. 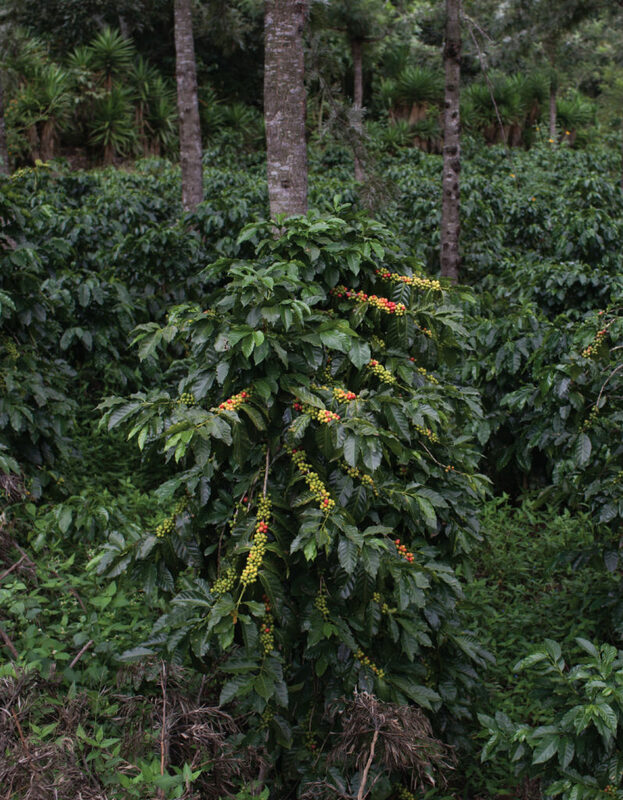 The group of coffee workers that Danwatch meets in Huehuetenengo reports that there are armed guards on the plantations where they work. In the town of Coatepeque, near the Pacific coast, Danwatch meets another group of workers who tell much the same story. “I’m a little afraid of the guards,” says a 25-year-old woman in a white lace top. Her mother, who works on the same plantation, agrees. A labourer in a blue shirt describes how a coffee worker he knows was taken away by guards because the worker had complained about working conditions. No one has seen that worker since. Guatemala has one of the highest civilian murder rates in the world: in 2014, 96 Guatemalans were murdered per week on average. According to the Overseas Security Advisory Council, an agency of the US Department of State, the extremely high murder rate can be attributed in part to the unwillingness and/or inability of Guatemala’s police and judicial system to bring criminals to justice. Workers that complain about conditions on coffee plantations risk being fired, blacklisted, threatened or disappeared. “Coffee [plantation] workers have real reason to be scared about violence to themselves or family members if they complain about working conditions or payment, try to unionize, or leave their jobs before the end of the harvest season,” concludes the American NGO Verité, which has anonymously interviewed 372 coffee workers over several years in Guatemala and has published a report on indicators of forced labour in Guatemala’s coffee sector. According to Verité, numerous signs of forced labour are present on Guatemala’s coffee plantations, such as false promises regarding terms of employment, induced indebtedness, non-payment of wages and withholding of identity papers. Danwatch contacted the coffee plantation owners’ trade organisation in Guatemala, Anacafé, and asked about several of the indicators of forced labour that are present on the country’s coffee plantations. Danwatch asked what the organisation does to ensure that coffee workers’ identity papers are not withheld on its members’ plantations; whether Anacafé can guarantee that coffee workers on members’ plantations do not end up in debt spirals; whether there are armed guards on its members’ plantations; and if so, what Anacafé does to ensure that workers on members’ plantations do not feel threatened by the armed guards. Anacafé also explained that the general insecurity in the country, as well as the authorities’ inability to guarantee security and protect private property rights, force Guatemalans to hire private security guards. Coffee producers who cannot afford guards, says Anacafé, risk becoming victims of theft. Many of the coffee workers are indigenous Mayans. Because of poverty, they leave their homes to work during the coffee harvest. Photo: James Rodríguez. Despite the fact that signs of forced labour are widespread on the country’s coffee plantations, Guatemalan labour organisations say that government inspectors very seldom visit to investigate working conditions. According to the report issued by Verité, the inspectors are understaffed and undermined by corruption. The report quotes a high-level representative of the Labour Inspectorate’s central office as saying that their work is seriously impeded by the high level of violence in Guatemala. She says that many inspectors do not dare to visit coffee plantations, fearing they could be threatened or killed, and cites the recent experience of one inspector who was threatened with a pistol on a plantation. In Guatemala, it is the government’s independent ombudsman that handles complaints from labourers regarding violations of human rights and workers’ rights, and who is responsible for contacting inspectors from the Ministry of Labour and Social Welfare and sending them out to plantations to examine conditions. Mario Minera, National Director of Mediation and Conflict Resolution for the ombudsman’s office in Guatemala, says that inspectors do not perform regular inspections. They only go out to a plantation when they have received a complaint. Minera says the ombudsman often faces a dilemma, however. “If the inspectors and the Ministry put pressure on a plantation owner and force him to close, the workers would lose their jobs,” he says. If a coffee plantation is not complying with labour laws, how easy is it for workers to demand their rights? “It would be complicated for the workers, without a doubt. They would have to be part of a larger movement that could help enforce their rights,” says Minera. When the coffee harvesting season is over, the coffee worker in the dark brown shirt works at odd jobs on plantations around the country, like felling trees. Changing working conditions for him and for the other coffee workers will require a complete transformation of the country, according to Ursula Roldán Andrade, director of the Institute for Research and Social Projection of Global and Territorial Dynamics at the Rafael Landívar University in Guatemala City. “Guatemala is considered to be a very weak state. In general, the institutions that are supposed to protect workers do not function,” she says. Roldán says that the businesses that buy and sell coffee can make a difference, however, because the plantation owners are economically dependent on them. “Buyers can put pressure on the plantations,” she says.